Nearly a year after migrant caravans captured the nation's attention and drew the ire of President Donald Trump, they appear to have fizzled out, marking yet another shift in their ever-evolving immigration policy narrative. (CNN) — Nearly a year after migrant caravans captured the nation’s attention and drew the ire of President Donald Trump, they appear to have fizzled out, marking yet another shift in their ever-evolving immigration policy narrative. Caravans, as they’ve largely become known, have deviated from their original purpose — from a way to highlight the plight of migrants, and in some cases, search for loved ones who never made it to the US — to another, seemingly safer, form of travel to the southern border. But now, migrants are splintering off into a number of groups, instead of journeying north in one large caravan. A Department of Homeland Security official told CNN that there are currently more than 10,000 undocumented migrants making their way to the US-Mexico border, but they do not appear to be traveling in caravans. Instead, the groups are “dispersed,” making them “very difficult to track,” said the official, who added that the caravan that arrived in Piedras Negras in early February has been largely moved out of the Mexican border town. Those who watch and study migration flows have also taken notice of the trend. “The innovation of traveling in groups without a smuggler may persist, but it seems to be devolving into smaller groups,” said Andrew Selee, president of the Migration Policy Institute, which studies global migration trends. In short, while traveling with a caravan might’ve been useful for trekking through Mexico, it proved impractical once arriving to the US-Mexico border, where entry became more difficult. In November, thousands of Central American migrants, part of caravans bound for the US, reached Tijuana, where many waited to seek asylum in the United States. Tensions flared up at the San Ysidro port of entry when some migrants tried to cross the border and authorities used tear gas to disperse the group. Central American migrants are still waiting to apply for asylum in Tijuana. During his presidency, Trump has cited caravans as reason for his signature border wall and strict immigration policies. He has referred to caravans as an “invasion,” and used the influx of migrants to help justify last month’s national emergency declaration. His administration deployed a number of controversial efforts to try to discourage migrants from coming to the border, including the “zero tolerance” policy that resulted in thousands of children being separated from their families and the so-called Migrant Protection Protocols that require some migrants to stay in Mexico until their immigration court hearing. But the issue is not exclusive to the US. Mexico is also reviewing ways to address the flow of migrants. “It’s a new phenomenon that we had not previously experienced,” said Mexican Secretary of the Interior Olga Sánchez Cordero at an event in Washington Thursday, adding that the government is evaluating who is organizing caravans, promoting them and leading them. Mexico has touted its efforts, under the new administration of Mexican President Andrés Manuel López Obrador, to address the flow of migrants from Guatemala, El Salvador and Honduras. In January, Mexico granted a large number humanitarian visas to migrants crossing its southern border. Of the 13,500 that came through the border in mid-January, only 10% continued to the US-Mexico border, according to Cordero. Cordero suggested that doing so has discouraged migrants from continuing their journey north and instead stay in Mexico. It’s unclear, however, whether those migrants will decide to journey north in the future. Over time, the arrivals of caravans have also strained cities like Tijuana, where migrants are passing through or waiting until they can apply for asylum. There’s no guarantee that caravans, the most recent of which have been spontaneous, will cease to exist. The pull of them in the past has been that they provide safety in numbers on the dangerous journey north. 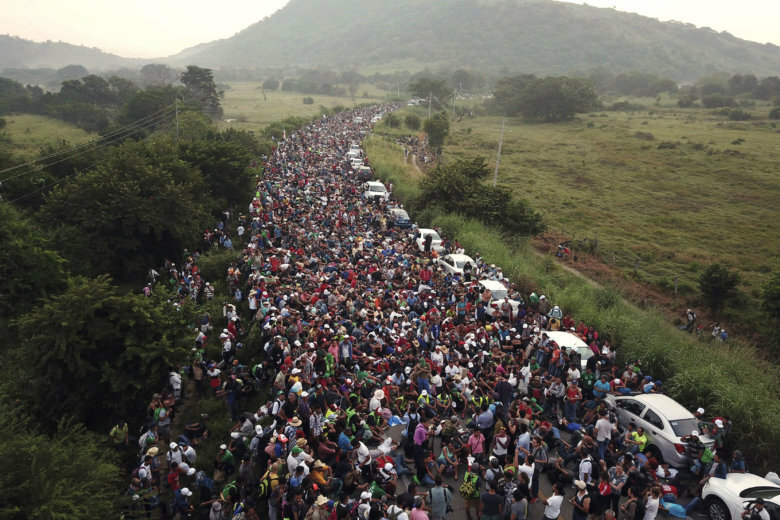 But for now at least, it appears that migrants are deciding to travel in smaller, more spread out, groups, in hopes of seeking asylum in the US.